Mercure Goa Devaaya Retreat, a luxury Naturopathy, Ayurveda and Yoga Cure Centre, is situated on Divar Island off the coast of Goa. It provides a holistic treatment route through Ayurveda, Naturopathy and Yoga under one roof and follows integrated alternative medical treatment. The centre is spread over 5 acres of beautifully landscaped gardens and offers 57 comfortable AC rooms with all modern amenities in Portuguese style along with exclusive 28 luxurious therapy rooms (modern/ rustic), one large Yoga Pavilion besides venues facing the river, Fitness Centre, Hydrotherapy rooms, Mud bath areas, Physiotherapy, Swimming Pool, Jogging track besides an array of diet centres serving pure vegetarian / Ayurveda diet. Mercure Goa Devaaya Retreat is surrounded by the healing waters of the Mandovi river, this magical isle, untouched by the hustle and bustle of city life, will immediately calm your nerves and tranquil your mind. It is just 10kms away from Panaji capital city and 5 kms away from ancient old Goa which has many historical places. Access makes a destination much more inviting and that's so true about Divar Island. Traveling to Divar is an ultimate experience as Divar is an Island of tranquillity in the heart of Goa. For getting on the island one has to cross the river Mandovi by ferryboat. Even with crossing the river it is only 45 mins drive from the airport and 55 mins from the Madgaon railway station. There are some restrictions on food. Devaaya is must visit place for peace lover and nature lover. I wait definitely visit again. Totally rejuvenating stay in nature with amazing hospitality. Never had such wonderful experience before. Food was very good, the place was awesome. The staff was very courteous. Geyser did not work. Rest all was fine. Great place, great food and excellent staff. It was our 2nd time at Devaaya and we loved it even more. They take guest hospitality seriously and have taken it to a next level, right from the reception to the housekeeping staff, everyone is there to see your are looked after well. Many thanks to all especially Vinod and Roland. Devaaya the best wellness resort ever. We will be back soon. Big spacious villa rooms with balconies. Peaceful view and lovely location. Great place to unwind and relax through yoga and ayurveda. It's very close from Karmali station, don't go to raibandar. Delecious and wholesome veg menu. Smoking and boozing not allowed. Will be back. Awesome view from the balcony. A very nice place, beautiful gardens and flowers everywhere, nice swimming pool, good spacious room and good yoga classes. Not an Ayurvedic resort at all. A breakfast to remember potatoes, oily pancakes, cornflakes with milk, toasts with ghee or honey. Fortunately porridge was always available. In 5 days I have not had a single medicine although promised many times by the doctor. 30 minutes meditation is a complete waste of time. I was as well surprised by buffet lunches and dinners as you can eat as much as you want to eat. Not very good for those who want to loose weight. 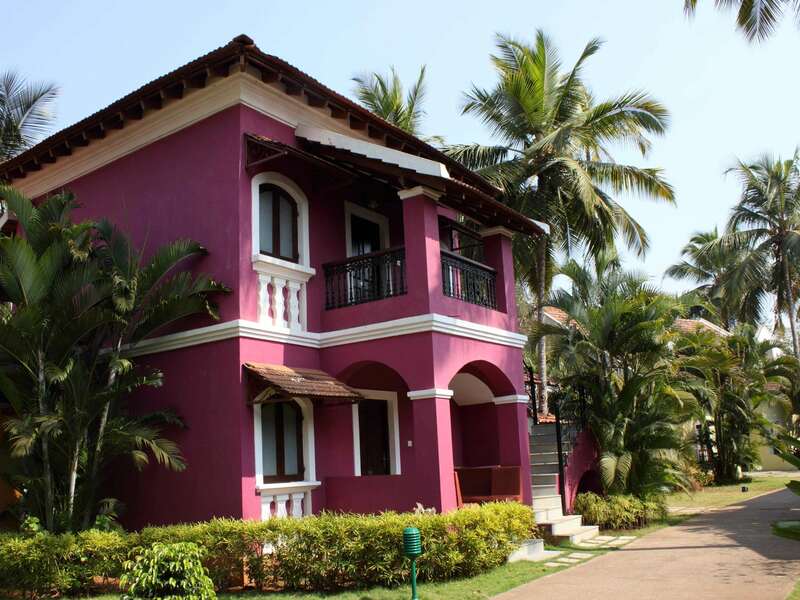 The resort is located on Divar Island, 25 minutes drive away from Panjim. The island can only be reached with a ferry which takes 5 minutes one-way to reach the island from the mainland. We were very pleased to find this secluded, private, beautiful, lush and well maintained Ayurvedic Resort with a tropical feel, colorful homes and apartments in Portuguese style / exterior, and very friendly and professional staff. A big swimming pool is available on the pool deck, and is in a good condition. The compound is neighboring the Mandovi River, at which Yoga classes are held early in the mornings at sunrise. Just great. Rooms/baths are well maintained, have A/C and fan, comfortable beds and TV. The photos on the website reflect the real situation. All in all a memorable holiday which we are looking forward to repeat. This hotel is located on an Island. Please don't stay there if you are going to visit goa. Otherwise its good.
" This beachfront resort offers signature spa therapies, water sports, kids corner and 5 dining venues for a great vacation.